Christmas lights are one of the most prominent ways in which the festive season makes a (visual) impact on the landscape. This part of the world has, over the past 10-15 years, witnessed increased participation in the practice of illuminating the exterior of houses and gardens with Christmas lights. 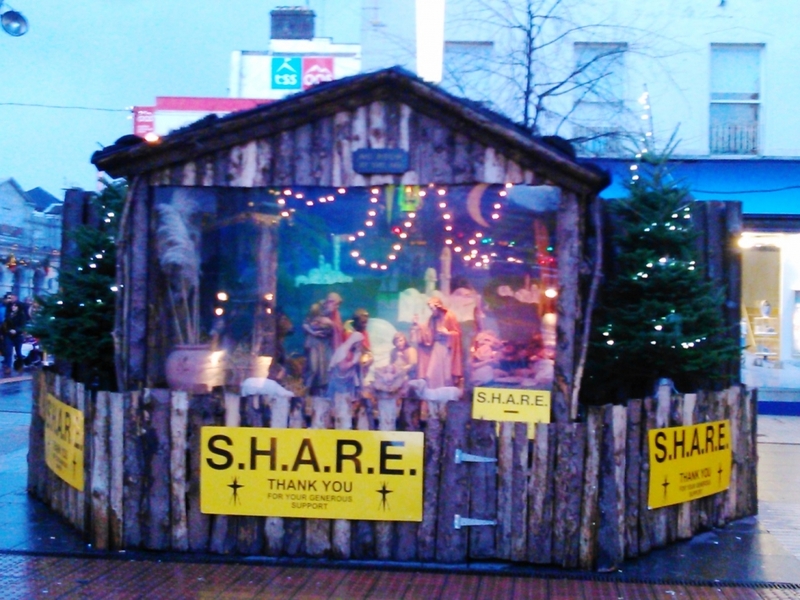 This has been seen as one of the many Christmas practices which the Irish and the British have adopted from the North Americans. 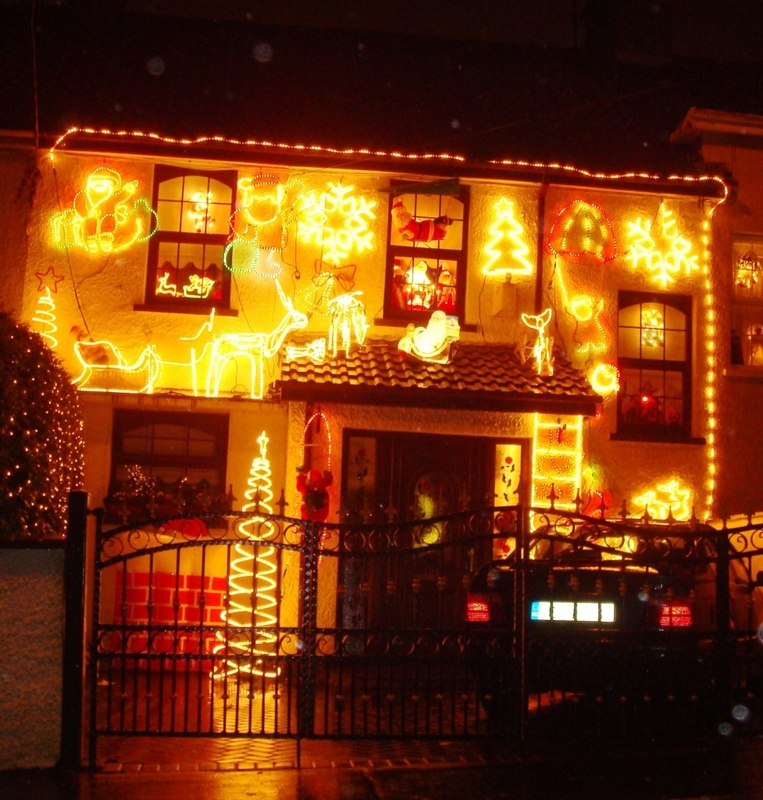 In the Republic of Ireland, the adoption of Christmas lights can be linked to the display-of-wealth and neighbourly-competitiveness that accompanied the Celtic Tiger in the 2000s. 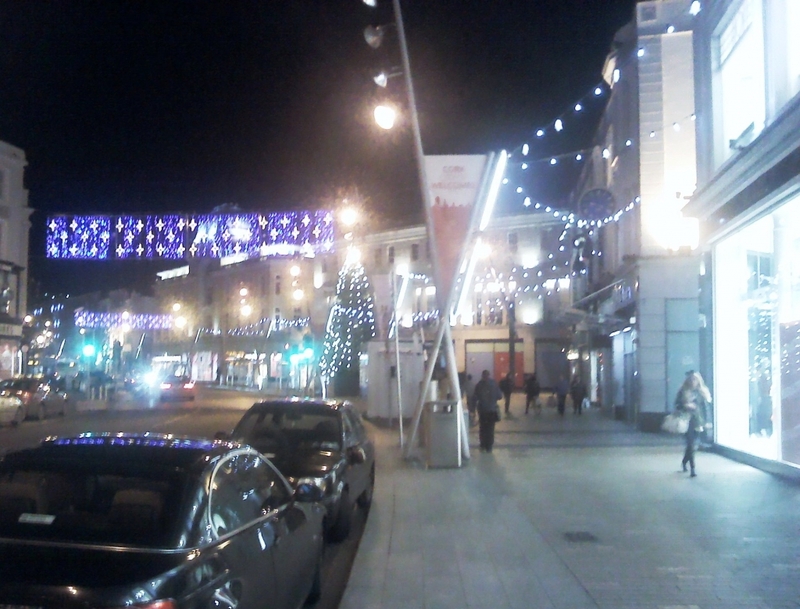 Based on a desire to explore the light displays in Cork and to compose a blog-post, I, along with my girlfriend (research associate), drove around the city in search of illuminations. The meandering route had vague destinations that were intermixed with random detours and wanderings. Upon the discovery of a noteworthy house – based entirely on our opinions on the richness and quantity of the displays – we slowed down, stopped momentarily and took a photo with a standard digital camera. The nature of the photos were influenced by the quality of the device, the inclement weather and the desire not to linger excessively outside private residences. In journeying, we speculated on the topic of Christmas lights as the focus of a PhD study, and found that with little effort a considerable range of social and cultural factors could be linked to the displays, including variation based on socio-economic areas, the meaning behind decorating a house, the influence of US American culture, any possible cluster of displays, the opinions of the owners, neighbours and passers-by, and so on. As with all good academic musing, the subject at hand was successfully related to all major social, cultural, political and economic issues, both historical and contemporary. 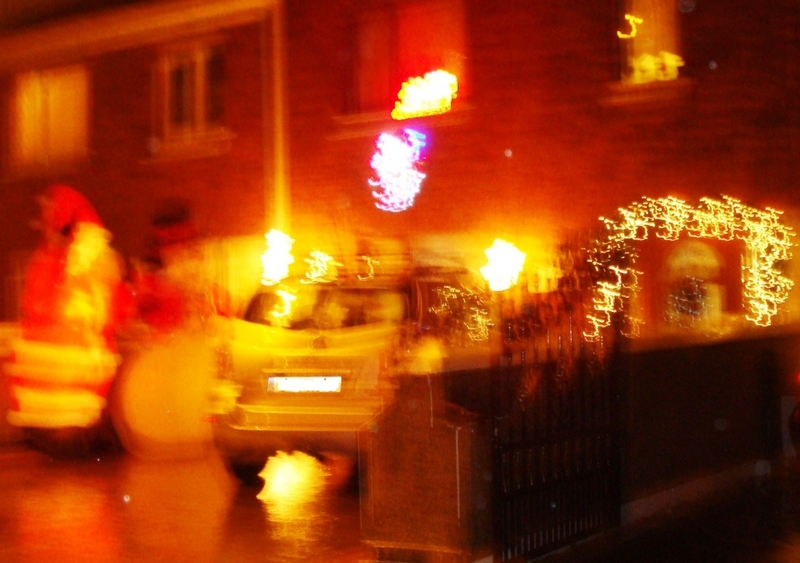 A number of brief observations were made throughout the evening’s engagement with the Christmas illuminated landscape. Firstly, there did seem to be a general correlation between the displays and socio-economic areas, with working-class and lower-middle class areas having a greater number of very elaborate displays, compared to the more sombre illuminations of middle-class areas. In fact, many middle-class areas were devoid of exterior lights, although there was usually some effort an internal illumination, such as Christmas trees or candle arches in the windows. Next, there were several instances of clustering effects, with a number of houses in a row having similar types and scales of decorations – this may lead to observations of competitiveness, social norms and other factors. 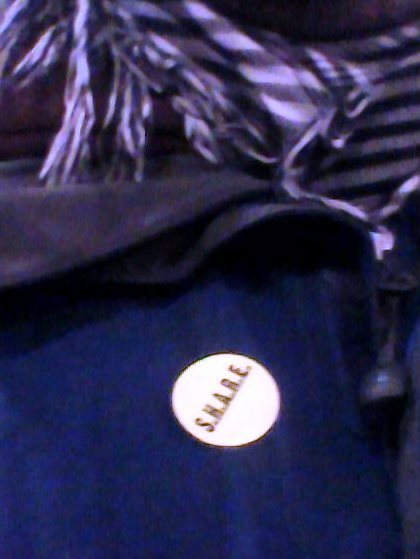 Thirdly, this is a night-time spectacle. Christmas lights and such decorations are enjoyed, consumed and noticed in the dark, while in daylight the wires are visible, the shapes obscure and the overall impression is absent. The illumination of the landscape in the dark hours of the winter symbolises the role of the festivities in Northern Europe, as the dreary night-time is transformed by the injection of complex and coloured arrangements of lights. 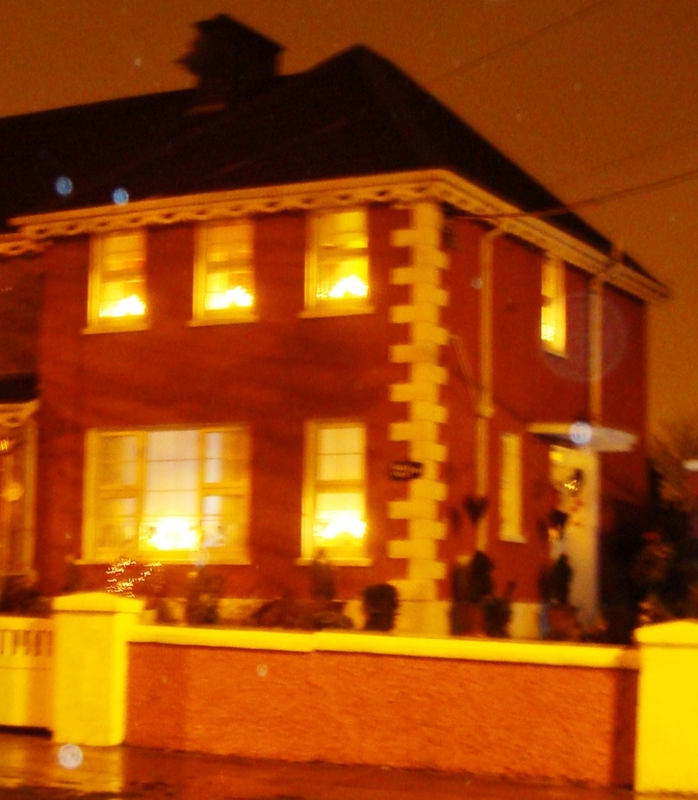 A series of rows and strings of light on a house near Ballintemple, although being an plentiful display it is still largely within the character of the house and surrounding area, as the lights are attached to the architecture features and shrubbery, thus, highlighting what is already present. 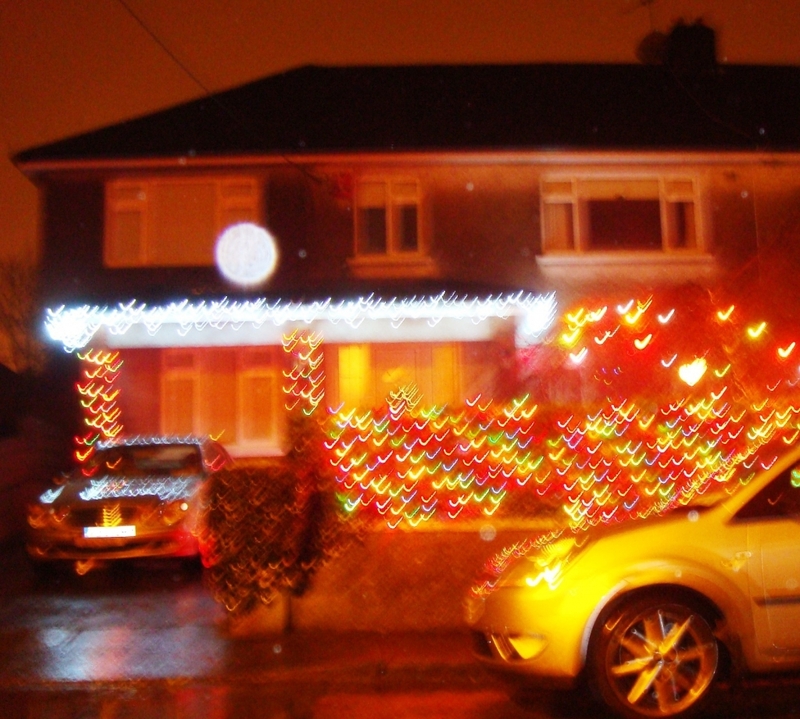 This display near Ballinlough has additional lighted features, such as the reindeer and Santa climbing, which make it a distinct spectacle, especially as the surrounding residences mainly lack exterior illuminations. The presence of candle arches in each of the windows creates a subtle Christmas display in this house near Ballyphehane. These arches, which originated in Northern European tradition, became very popular about 20 years ago, and can be found in the windows of many houses. 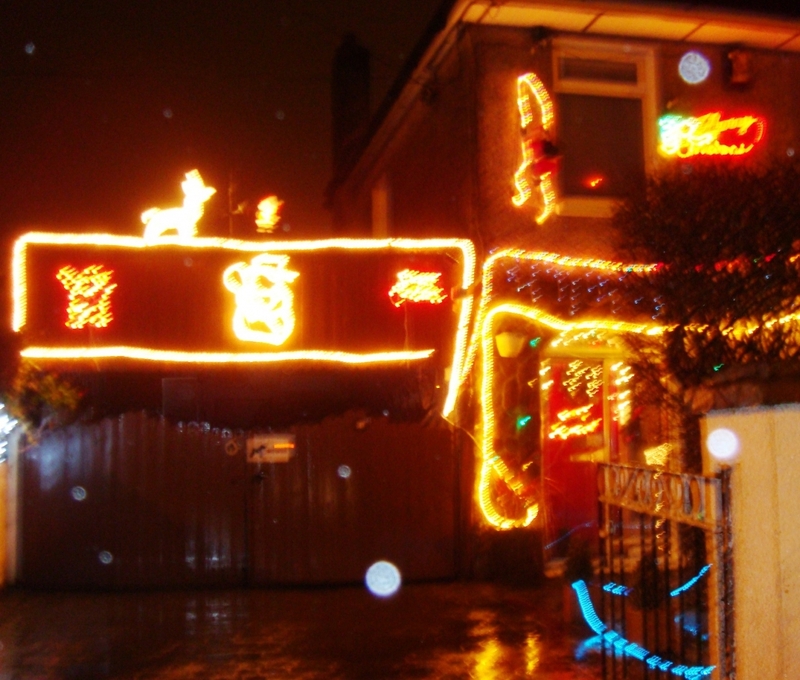 A very elaborate illuminated collection covers this town house near Churchfield. The intensity of the display is emphasised by the fact that the entirety of the front of the house seems to be adorned with some feature or other. The photo captures a fraction of the sheer glow of the scene. The giant blow up Santa and snowman in front of this house near Ballyvolane make this a relatively unique display. Edensor and Millington (2009) ‘Illuminations, Class Identities and the Contested‘, Sociology, 43 (1), pp. 103 -121.